The High Resolution Imaging Science Experiment (HiRISE) camera aboard NASA's Mars Reconnaissance Orbiter acquired this closeup image of a light-toned deposit in Aureum Chaos, a 368 kilometer (229 mile) wide area in the eastern part of Valles Marineris, on Jan. 15, 2015, at 2:51 p.m. local Mars time. 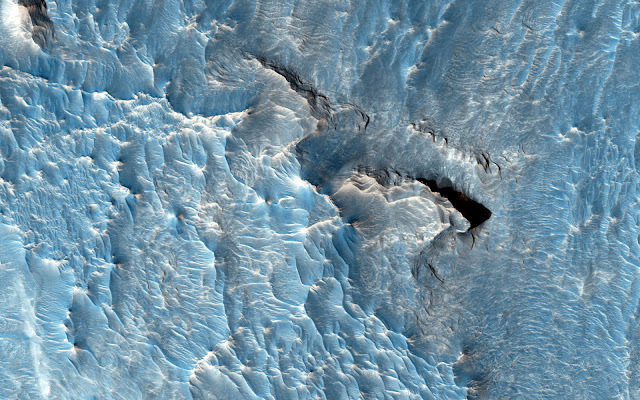 The objective of this observation is to examine a light-toned deposit in a region of what is called “chaotic terrain.” There are indications of layers in the image. Some shapes suggest erosion by a fluid moving north and south. The top of the light-toned deposit appears rough, in contrast to the smoothness of its surroundings. Image Credit: NASA/JPL/University of Arizona. Caption: HIRISE Science Team.